All things being equal, the more segmented and targeted your landing page is, the higher your conversion rate will be. Everyone in marketing knows that. However, the other part of the equation that is rarely talked about — the more segmented and targeted your landing page is, the more resources (time, focus, development, agency hours, etc.) it will likely take. Sure, there are some tools that will automate this process by automatically displaying, say, a relevant product recommendation. There are some that will reduce, but not eliminate, extra work by pulling in anything from a relevant dynamic keyword change to entirely different content blocks. But for most companies today, getting more segmented with their landing pages is going to take time or money that could be spent on something else. So how do you find the balance? When is it worth launching a new landing page to serve a new motivation or when can you just try to make your current landing pages serve multiple motivations? We’ve created a free worksheet to help you make that decision and (if necessary) get budget approval on that decision from a business leader or client. This quick-and-easy tool helps you decide when you need a new landing page to target a more specific audience. Here is a quick breakdown of some of the fields you will find in the worksheet, which has fillable form fields to make recording all the info easy for you. Step 1: What do you know about the customers? Who are your ideal customers? It’s important to know which customers your product can best serve so you can make the right promise with your marketing. Possible sources of data to answer this question include transactional data, social media reviews, customer interviews, customer service interactions, and A/B testing. The most popular way to learn about customers is with an internal metric analysis, which is used by 69% of companies. You’ll want to know demographics like age(s), gender(s), education, income(s), location(s) and other factors that are important to your product. You’ll also want to know psychographics like what they move toward (their goals), what they move away from (their pains) and what value(s) they derive from your product purchase. You also want to know who the page needs to serve from among the customers. Is it someone who has never visited before and is unaware of the category value? A repeat purchaser? And so on. Knowing their previous relationship to the landing page, your company and your products is important to creating high-converting landing pages. Step 2: Based on what you know, what can you hypothesize about the customers? What are the motivations of visitors? Visitor motivation has the greatest impact on conversion, according to the MECLABS Institute Conversion Sequence Heuristic. You can get indications about what motivations these visitors might have, based on sources like inbound traffic sources, previous pages viewed, A/B testing results, site search keywords, PPC keywords, customer service question, and testing, not to mention the previous info you’ve already completed about demographics, psychographics and the like. You want to hypothesize what different motivations visitors might have, and why they have that motivation (keep asking why until you get to the core motivation, this can be very informative). For example, I have a Nissan LEAF. I had multiple motivations for buying a LEAF. Motivation A was to get a zero-emission car. Motivation B was to save money on gas, maintenance, etc. Drilling down into Motivation A, why did I want a zero-emission car? Because I didn’t want to pollute. Why? Because I didn’t want to increase local air pollution or add to climate change. Why? Because my kids breathe the local air and will be impacted by climate change. Getting down to the core motivation might create messaging that taps deeper into your customers’ wants and needs than simply mentioning the features of the product. Which brings up the next question. What must the landing page do to serve these motivations? You can use the previous info, previous customers, analytics, previous purchases — and intuition to answer that question. Essentially, you want to be able to fill in the blanks: The landing page must do ________________ so customers can ______________. Use as many as apply to the motivations you are trying to meet. Is there a natural grouping? Are they very different? Using the car example previously, the landing page must do a good job tapping into customers desire for a better, cleaner world so customers can see the deeper environmental impact of a driving a zero-emissions vehicle. Step 3: Based on customer motivations, does it make business sense to create a new landing page? This is where the rubber meets the road (car analogies notwithstanding). All marketers are pro segmentation. But you can’t do everything. On the flip side, marketers can underinvest in their landing pages and overinvest in traffic driving and ultimately leak money by having too few, unsegmented landing pages that are trying to do too much for too many different motivations — and thus, doing none of them well. 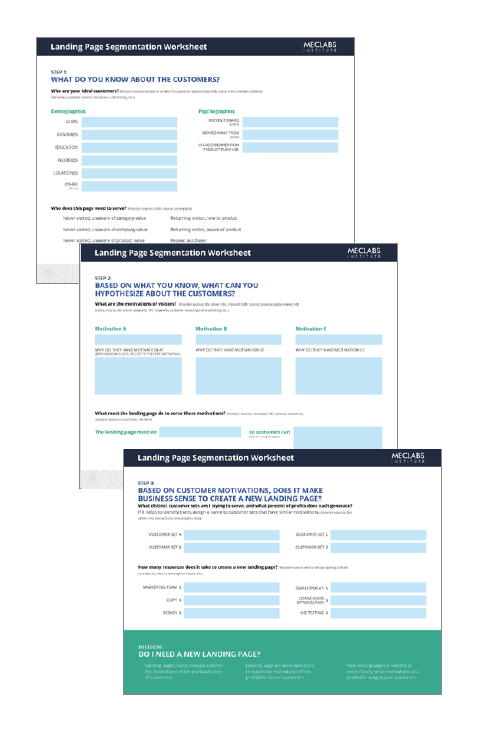 Does it make business sense to make a new, more segmented landing page? Three more landing pages? Dozens of dynamically generated content boxes or headlines targeting different motivations for a specific landing page? Now that you have a sense of the different motivations you’re trying to serve, you should ask what distinct customer sets these customers represent, and what percent of profits each generates. If it helps to identify them, assign a name to customer sets that have similar motivations. Whether it’s something like Aspirational Suburbanites or Laid-back Lindas, some element of personification can help you feel closer to the customer. You should combine your transactional and analytics data with the previously completed info to arrive at the customer sets and percent of profit generated by each. This is the value side of the equation. For the cost side of the equation, you need to ask how many resources it takes to create a new landing page? Based on your work with web or design agencies, outside consultants and internal development teams, it helps to put a cost to the work even if it’s internal salaried employee time that you won’t technically be billed for. That will help you understand if there is an ROI for the work. Costs you want to consider are your marketing team, copy, design, development, conversion optimization and A/B testing. Decision: Do I need a new landing page? With this info, you can decide if you need a new landing page. Does the landing page you already have or the one you are currently developing closely enough match the motivations of the profitable core of customers? Will the landing page work with editors to match the motivations of the profitable core of customers? Or is a new landing page needed to more closely serve motivations of a profitable subgroup of customers? 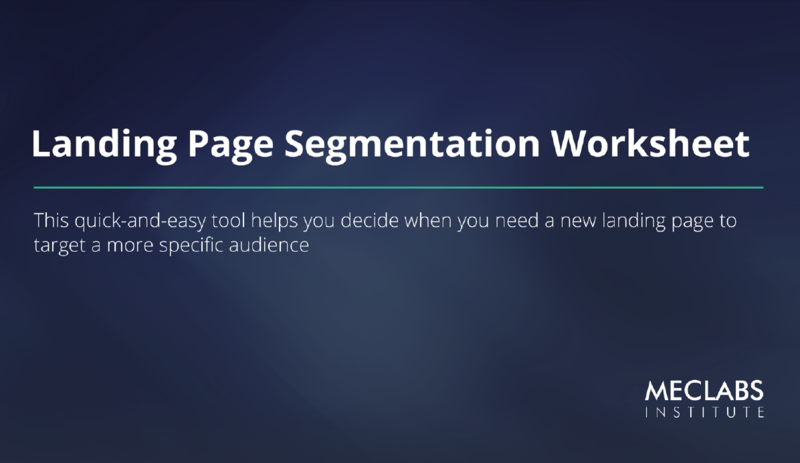 Seeing the amount of business you can get — and the cost it will take to get you there — can help you get past the simple idea that segmentation is good or that your current landing page is good enough for all customers. You can move on with a deeper understanding of whether or not your business should invest in a more segmented landing page(s) to better tap into motivations of a uniquely motivated (and profitable) set of customers. Use this worksheet to make the decision for yourself and make the case for budget to your business leaders and clients. Special thanks to MECLABS Web Designer Chelsea Schulman for designing this sharp-looking interactive worksheet. Lead your team to breakthrough results with A Model of your Customer’s Mind – These 21 charts and tools have helped capture more than $500 million in (carefully measured) test wins.